Chocolate Covered Peanut Butter Pretzels are the PERFECT no-bake combo of salty and sweet with creamy peanut butter frosting and an indulgent chocolate coating! 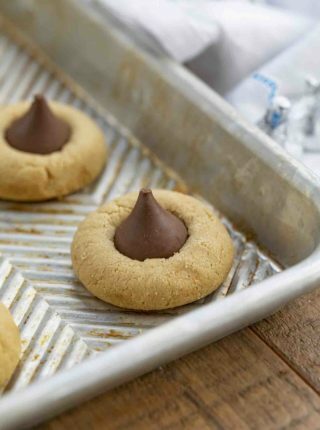 Easy dessert recipes like Buckeye Balls, Peanut Butter Cookies, Chocolate Covered Pretzels, and Peanut Butter Blossom are really popular on the site, but really I think we just love all things chocolate and peanut butter. 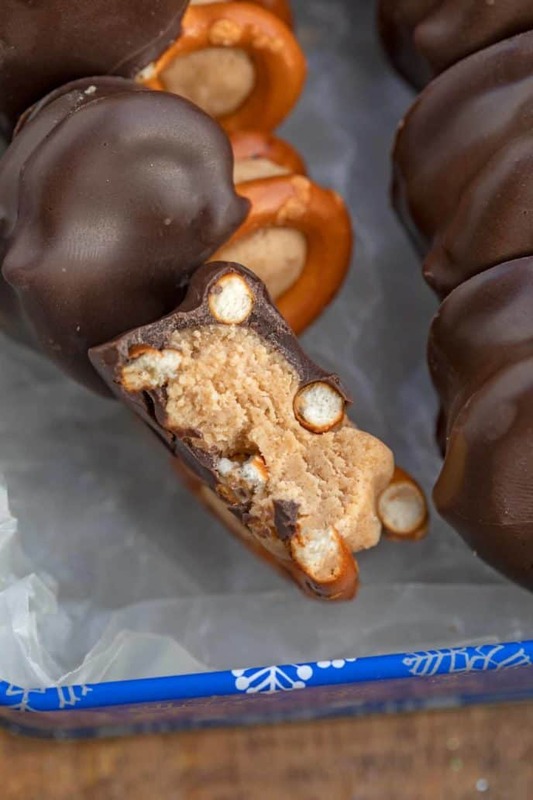 Chocolate Covered Peanut Butter Pretzels are sweet, crunchy, and salty, made with creamy peanut butter frosting sandwiched between two pretzels, then dipped in melted chocolate and hardened into candy. They’re basically the perfect snack, because you can make a lot of them at once and they’re easy to travel with in a ziplock bag. You can also wrap these up and give them out as gifts during the holidays! CAN I FREEZE PEANUT BUTTER PRETZELS? You can freeze these peanut butter pretzels, but I would personally only freeze them if I was not going to be serving them afterwards. When chocolate defrosts, it can get condensation on it and it won’t look as nice anymore. I recommend making this recipe on the same day you’re going to serve it. HOW LONG DO PEANUT BUTTER FILLED PRETZELS LAST? Peanut butter pretzels will keep for 1-2 weeks refrigerated in an airtight container. Technically you could probably keep these on the counter, but the peanut butter frosting in the middle might warm up and spread too much as it sits out. WHAT OTHER TOPPINGS CAN YOU ADD TO PEANUT BUTTER PRETZELS? 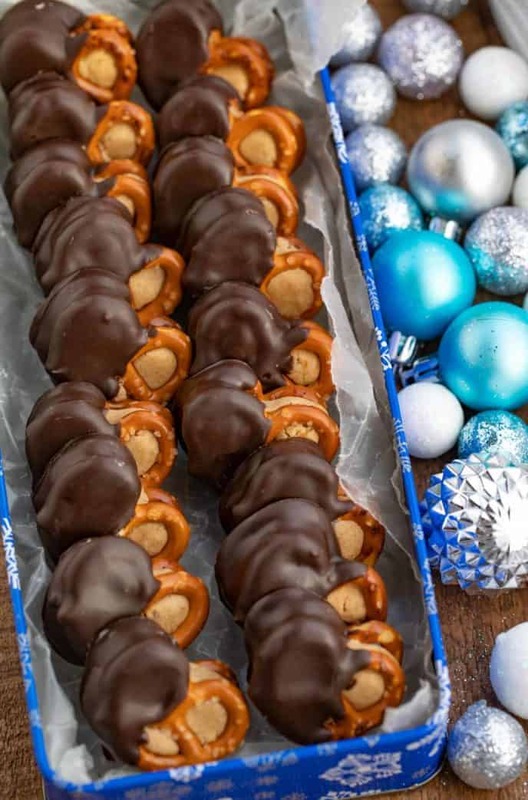 You can make these peanut butter pretzel bites more festive for holidays or events with some creative toppings. I like to add these ingredients right after dipping the pretzels in chocolate, before it hardens to make sure they stick. You can make these peanut butter filled pretzels with regular chocolate chips or white chocolate chips. If you’re using white chocolate chips, you can also check out almond bark, which is like white chocolate but smoother and with a richer flavor. When I snack on these pretzel bites, I also like to pair them with my favorite hot chocolate recipe! If your chocolate isn’t melting right, try whisking it with some coconut oil to smooth it out. Or try to melt it in a double boiler, if you’re having trouble with the microwave. 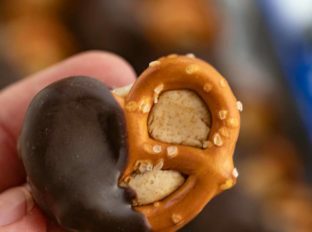 You can make these pretzel bites with any shape of pretzel, but keep in mind that they are sandwiches so I wouldn’t try this with pretzel sticks. 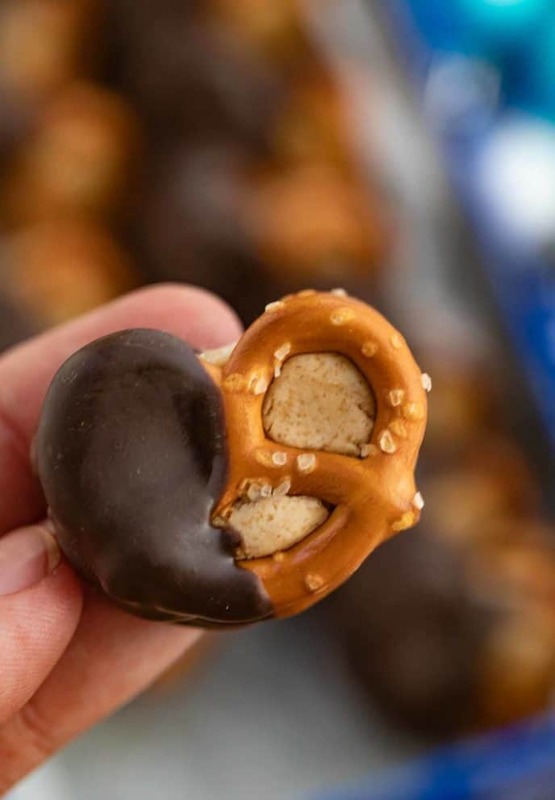 This peanut butter filled pretzel recipe calls for dipping the pretzels half way into the chocolate, but you can go all the way if you want more chocolate in your pretzel bites, just be sure to use a fork and tap against the edge of your bowl to remove the excess chocolate. I use unsalted butter to make peanut butter filled pretzels, because I like to control the amount of salt we’re using in our ingredients, especially because the pretzels are already salted. If you’re going to snack on these peanut butter pretzel bites right away, you can add a slice of banana into your bites. I wouldn’t recommend this if you’re going to be making these ahead to snack on later in the week, because the banana will turn brown. Try using peanut butter chips if you’re having trouble with regular peanut butter when making your peanut butter pretzel bites. You can usually find them next to the chocolate chips in the grocery store. 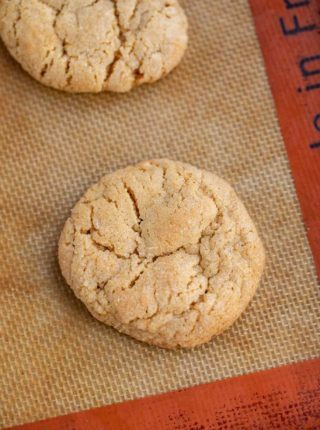 Make sure your baking sheets are lined with parchment paper before you start, which helps keep these bites from sticking, and also with cleanup! To your stand mixer with the beater attachment add the peanut butter, unsalted butter, vanilla and powdered sugar until combined then place 1 tablespoon between 2 pretzels to form a sandwich. 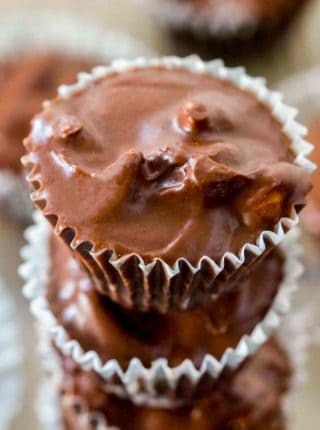 Melt the chocolate in a small bowl in the microwave in 30 second increments then dip the sandwiches halfway in the melted chocolate and place onto a baking sheet lined with parchment paper to harden in the refrigerator. It’s very tempting to want to so I don’t blame you! This is such a tasty idea! The salty and sweet flavors, plus the different textures- it just sounds so tasty! I love this idea for a little afternoon snack!! My grandkids are coming over for a sleepover. They love helping me in the kitchen. I think this would be the perfect treat for them to make (and eat too). Perfect to do with the grandkids! Have fun! Oh my goodness these look amazing! 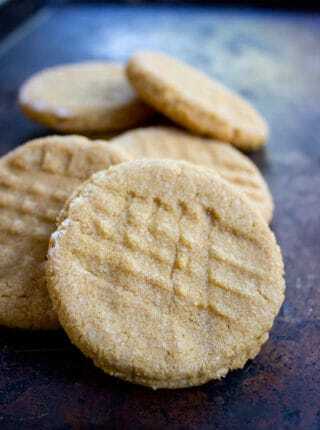 I am going to make these for my peanut butter loving husband! Be prepared for him to not want to share, haha!